Cinderella Story is one of the best-known fairy tales and short stories for kids. It is an endearing tale of a young girl named Cinderella, whose misfortune was magically changed to a remarkable fortune. Cinderella Story features unpleasant behavior of stepmother and stepsisters towards Cinderella, a magical transformation of Cinderella to a pretty princess, kind-hearted fairy god-mother, lost glass slipper and prince's hunt for Cinderella. 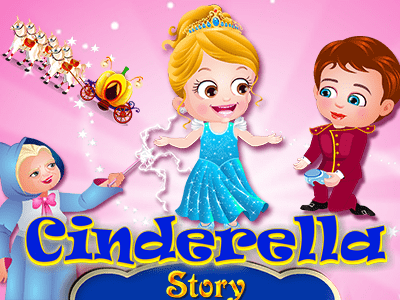 Enjoy watching Cinderella Story video, the bedtime story for kids, toddlers and babies to enjoy. Once upon a time, in a far away land, lived a cute and sweet girl named Ella. She was born in a lovely home to a beautiful mother, Lily, and a hardworking merchant father. They all were happy in their sweet home. Being a merchant, Ellaâ€™s dad used to travel a lot. Because he wanted to give his wife and daughter all the happiness in the world, he worked hard, day and night. Every time he returned from his journey, he never forgot to bring them flowers. Father:Â And, my pretty darlings, I have got a surprise gift for you. Father: We should be able to move there soon. Full of joy and excitement, they all boarded their horse cart to start a journey to their new home. The new mansion was huge and beautiful, with a lush garden in the front. Mom: Wow! What a beautiful garden. Ella, letâ€™s plant fruits and flowers here. Seasons changed, the wheel of time kept spinning, and now Ella was growing into a beautiful girl.One day, while she was collecting apples in her garden, she saw two beautiful birds. Ella fed them apples and made them her pets. Ella: You are so cute! Will you stay with me? Father: Ella, can we talk? Ella: Go out and play, little ones, but no fighting. Ella: Yes, dad. What is it? Father: Darling, I have married a nice lady and she has arrived with her two daughters. Father: I know itâ€™s difficult for you to accept, but I am doing all of this for you, for me, for us. Father: Letâ€™s welcome your new mom to our home. As soon as Ella saw her new mother, she greeted her. Father: Iâ€™ll show them around. Days passed by fairly smoothly, but then Ellaâ€™s dad had business to take care of in another town. Ella: Dad, you forgot your Hat. As soon as Ellaâ€™s father was out of sight, Ellaâ€™s stepmother and stepsisters started behaving rudely with her. StepMom: Ella donâ€™t sit with us. You must take care of the household chore. Give the house a good scrubbing and do the laundry. Poor Ella didnâ€™t know what to say. She was heartbroken to see her stepmother suddenly being so mean to her. Her sisters were giggling. It was obvious they enjoyed making her sad. StepSis: Ella I’m starving. Where is my sandwich? StepSis: Ella, my sandwich, too! Ellaâ€™s two stepsisters and stepmother kept her busy all day long with their never-ending demands. But she never complained and did her work with a smile on her face. And while doing all the household chores, Ella never forgot to take care of her pets. She always made sure to feed Charlie and Budgie with bird seed. Poor Ella said nothing and continued serving them tea. Suddenly her stepsister laughed. StepSis: Oh, Mum! We can call her Cinderella, as she is always covered in cinders. After a long journey, her father returned home with gifts for all. He handed his stepdaughters their gifts, and they were pleased to see the beautiful dresses he bought for them. Father: Darling, why do you look so messy? StepMom: Oh dear, she was playing with her pets near the fireplace. That must be how she made her clothes so dirty. Ella: Oh Dad. These flowers remind me of Mother..
His stay was a wonderful break for Cinderella from her stepmotherâ€™s cruelty, but it was terribly brief. Before long, Ellaâ€™s dad left again for business, bidding them all goodbye. StepMom: Cinderella, get back to work! One fine day, there was a knock at the door, and when Cinderella answered, she saw a royal guard holding a scroll with a big bow around it. Guard: This is an invitation to the Princeâ€™s ball. Suddenly, her unkind stepmother snatched it from her and began to read to herself. StepMom: Girls, we have an invitation for the Royal Ball! And every girl in town has been invited by Prince Charming himself. StepMom: Yes, you can. But only if you finish all chores, and make beautiful gowns for Ashley and Alisa. StepMom: Oh, my darlings, you both look marvelous! When Ella saw them all dressed and ready to leave for the ball, she was hesitant. Ella: Mother, now can I join you and go to the Ball? StepMom: Oh, Cinderella… How can you attend the ball? You donâ€™t even have a gown. Stay home and finish cleaning the attic. Ella: Please, Mother! I’ll do it all after I attend the ball! Poor Cinderella saw her stepmother and sisters leaving for the ball, and started sobbing. Ella: Why did they do this? I did everything she asked me to do, and she still didn’t take me to the ball. Sad and alone with her pets, she was sitting quietly in her room when suddenly a dancing light appeared and from inside stepped a Fairy Godmother in front of her. Â Fairy: My dear child, whatâ€™s the matter? Why are you so sad? Fairy: Donâ€™t worry, dear, I will help you. Narration: The Fairy waved her wand and dressed Cinderella in a beautiful gown and pretty glass slippers. Fairy: Ella, you look gorgeous, dear! Fairy: Oh, donâ€™t you worry. Can you fetch me seven mice and a pumpkin? Fairy: Then let us go to the garden. The Fairy waved her magic wand again and turned the pumpkin into a beautiful carriage. Fairy: Câ€™mon now! Board your carriage and attend the Royal Ball and meet Prince Charming! Fairy: Remember Cinderella, you have to be back before the clock strikes midnight, or else your carriage will turn into a pumpkin and your beautiful dress into rags. Ella: I’ll remember about the spell. Thank you for helping me! She bid goodbye to the Fairy Godmother and left for the ball in her beautiful carriage. Cinderella arrived at the palace and saw that everyone was already enjoying themselves at the Ball. The palace was huge, with a glittering Chandelier and floors that shone like mirrors. It was decorated with lights and beautiful flowers everywhere. Prince: May I have the pleasure of dancing with you? When the Prince spotted Cinderella, he was instantly struck by her beauty. He approached her and gracefully bowed. She suddenly remembered the Fairyâ€™s spell and how it would be broken when the clock struck midnight. Panicking, she started to leave. Prince: My lady, whatâ€™s wrong? Cinderella rushed out of the palace before the spell was broken, and in her hurry, left her glass slippers behind. Cinderella was running out of the palace, and though the prince chased her, it was too late. The Prince found her glass slipper on the stairs and ordered his royal guard to assemble an army. Prince: Try this slipper on every girl in the kingdom! I have to find that girl. The royal guard started searching for the beautiful girl whose foot would fit in the glass shoe. Back at the house, Cinderella was back doing her daily chores and taking care of her pets. Her stepsisters, as always, were lazing around. And thatâ€™s when they heard someone knock at the door. Prince: Iâ€™m looking for the girl whose foot will fit this shoe. StepMom: My daughters would love to try the shoe. Both her stepsisters tried to fit their feet in the shoe, but they were unable to do so, as the slipper was too small and delicate. StepMom: She is just a servant. As soon as she slid her foot inside the slipper, it was clear that it fit her perfectly. The Prince was happy and so his royal guards, but her stepmother and sisters didnâ€™t understand how the shoe fit Cinderella. Finally, Prince Charming and beautiful Cinderella were best friends and they played and enjoyed in the big palace along with their pets happily ever after.